Most racing games offer three ways to fight off opponents – you either shoot power-ups to destroy your opponents (as seen in “Blur” or “ModNation Racers”), you smash your opponents out of the way and off the road (like in “Burnout 3: Takedown” or “Need for Speed: Most Wanted”), or you have to rely on your skills to get ahead of your opponents (as in “Midnight Club: Los Angeles” or “Test Drive Unlimited 2”). But in “Split/Second,” developed by Black Rock Studio and published by Disney in 2010, you rely on the environment to do the dirty work for you. That’s what made “Split/Second” stand out from the crowd in 2010, and it’s worth going deeper as to why this game is so addictive. The plot is quite simple: there’s a TV show on air known as “Split/Second,” and you have been cast for the next season. Sets have been built so that most objects will be able to destroy your opponents after you trigger Power Plays. Power Plays are actions you can activate when you’ve done enough stunts to fill your Power Play bar. You can then trigger a Level 1 or 2 Power Play, which will cause something in the environment to try to destroy your opponents. Cars and gas stations will blow up, cranes and wrecking balls will spin around, and building materials will fall from the sky. Sometimes, Power Plays can be used to switch routes mid-race. A huge change in the race’s route will be made because you can make skyscrapers fall, ships crash, and fires blaze! 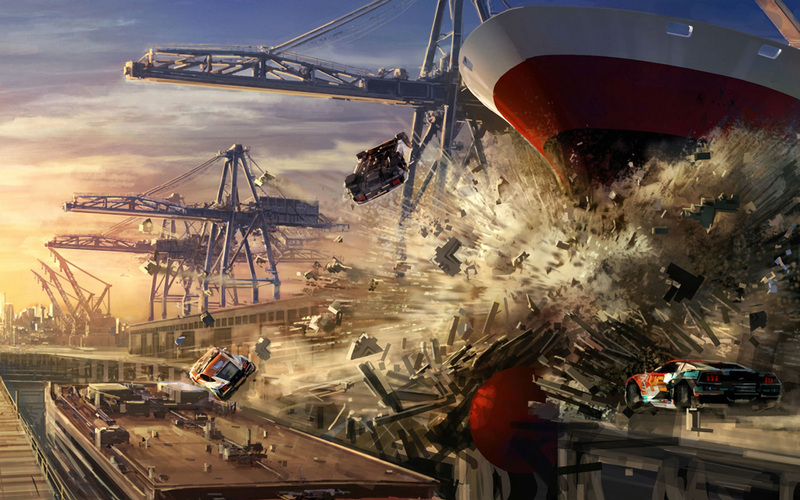 One thing I have noticed, unfortunately, is that there is no real damage system in “Split/Second” like in “Burnout: Paradise” or “Forza.” There are two different damage statuses: perfectly fine… or basically dead. You can wreck extremely easily in-game by crashing into an object that you can use a Power Play on (even at low speeds) – but anywhere else is basically impossible! That means if there’s a Power Play object near the finish line on the last lap, you can mistakenly hit that object at a really low speed and still wreck! This can easily take you from 1st place to last. 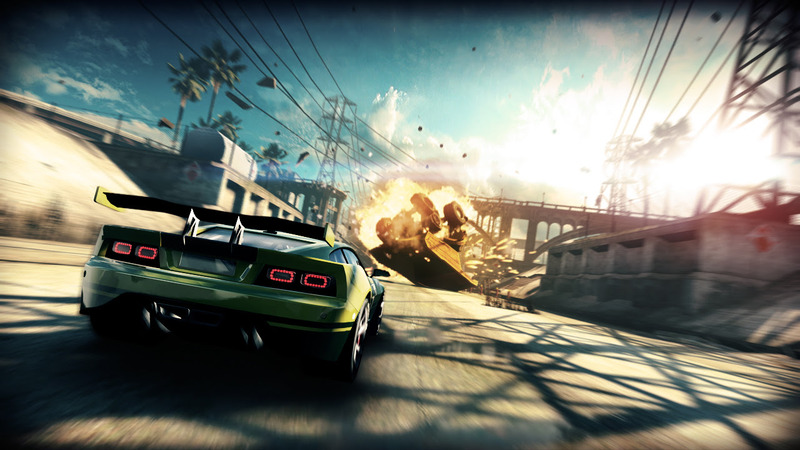 There are 6 game modes in “Split/Second”: Race, your classic circuit race; Detonator, a time trial mode where you must avoid Power Plays that are automatically triggered; Elimination, your average elimination race; Airstrike, in which you must avoid missiles from an attack helicopter to earn points; Air Revenge, where you can take your revenge on the helicopter, triggering Level 1 or 2 Power Plays to shoot missiles toward the heli in a certain time limit; and Survival, one of the more unique modes. In Survival, you must try to pass big rigs dropping explosive barrels to earn points. Blue barrels will slow you down and make you lose control, but red barrels are death. You hit one of them…dead. However, you have infinite lives until a timer (that you regenerate by passing big rigs) runs out, leaving you with one more life. If you crash anyway, you’re done. Have you seen this game mode in any other video games? No. Exactly. There are a variety of vehicles to choose from when racing as you progress throu gh the game, ranging from racing trucks to hypercars, each with their unique pros and cons. Trucks are pretty slow but can withstand explosions and crashes better than any other cars. Hypercars are quick as a flash but as strong as a kindergartener when trying to lift a high schooler’s backpack, and so on. Plus, you can earn special bonus cars by entering certain codes in the options menu. You can see the codes here. Once you unlock one of these cars it’s only available in Quick Play, a mode for people who play for only a few minutes at a time. “Split/Second” is one of the more unique and original games I’ve reviewed so far. Its Power Play concept is one of the more notable changes to the arcade racer formula. While having some minute flaws, “Split/Second” still impresses me with its all-around quality considering the other racing games released at the same time (like “Sonic Free Riders” with the Kinect… oof). That’s why I give “Split/Second” an 8.5 out of 10. I highly recommend that (if you haven’t already) you get a copy of this game and a compatible console.